Bruce Arians prefers two tight end sets, so it makes sense to add another player at the position. At this time, it looks like Carlson will team with current starter Rob Housler at the position in 2014. Carlson is a decent talent who can contribute, but shouldn’t be a featured player in any offense. The problem for the Cardinals is that Housler is a similar player. He tested well at the 2011-scouting combine, but the former third round pick has yet to turn that into a consistently productive NFL career. Regardless of who starts between Carlson and Housler, Arizona will not be fielding a dynamic talent at the position. It doesn’t help that neither is a great blocker, or the perfect picture of health, either. In theory, this signing should not prevent the Cardinals from continuing to supplement the position in the draft. However, if they feel better about these two players than the general public does, they might bypass tight ends anyway. Signing a player like John Carlson, at the very least, takes away any great pressure to address the position. Not much. Carlson surprisingly had some productive games with the Vikings last season, but he was overpaid, and not part of their future plans. Minnesota has Kyle Rudolph firmly entrenched as their starting tight end. He will be the primary beneficiary of Carlson’s departure, and the few snaps he took with him. Carlson is going to miss out by not being in Minnesota next season. New Vikings’ offensive coordinator, Norv Turner, is renowned for his effect on tight end production. Taking both of these factors into consideration, its quite possible Rudolph has his best season yet. 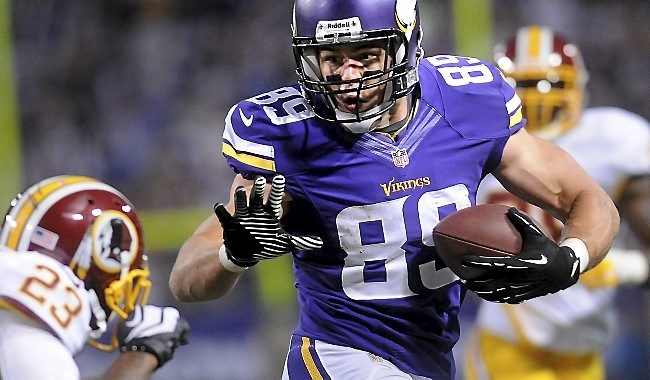 The #Cardinals are paying TE John Carlson $4.65M over two years, according to a source. As with yesterday's free agent signing the contract is the most puzzling part of this marriage. Carlson’s agent somehow got him a big deal when he left Seattle in free agency two years ago, and he has struck gold again. Paying a mediocre tight end like Carlson over $4.5 million through two years seems like a puzzling choice. It feels like the Cardinals are overrating Carlson off of a few games’ sporadic production. There were certainly other options on the tight end market, both better players and comparable ones that would have come cheaper. The player to team fit makes sense, but again, John Carlson is a role player only. If he catches much more than the 32 passes than he did last year, it would be an upset. If the Cardinals try to squeeze much more out of him, they will be disappointed with this signing.